Funny thing how premonition works. Spent a lot of time thinking of Ike while driving through the rich, rolling farmland of his home state from Gettysburg towards Niagara last week. 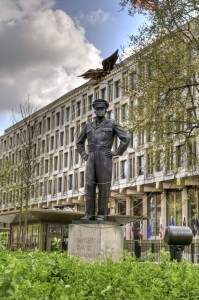 Remembering the stories I had heard of his time on Grosvenor Square when the headquarters of the Allied Command were temporarily located there during the dark days of WWII. Walking to and from work on the Square back in the late 80’s, I had noticed the daily progress at the shrouded worksite that was to be the Eisenhower statue. Looking out the window of the library of MacDonald House one afternoon, I noticed a crowd assembling around that very spot in front of the US Embassy. It could only mean one thing. I bolted from the High Commission and was rewarded with my only in-the-flesh glimpse of the Iron Lady who was doing the honours in the official unveiling which for security reasons was entirely impromptu and unpublicised. Fantastic moment of historical confluence! One who had played a vital role in winning the “Hot” war against facsim and the other who had played an equally vital role in winning the “Cold” war against its ideological bedmate. Ike and Maggie. Two lions of the Anglosphere. Thanks for the memories.